Soon after a huge solar storm erupted on May 20-21, 2011, a comet (bright streak at lower right) plunged into the sun. This shot is a still from a video taken by one of NASA's twin STEREO spacecraft. 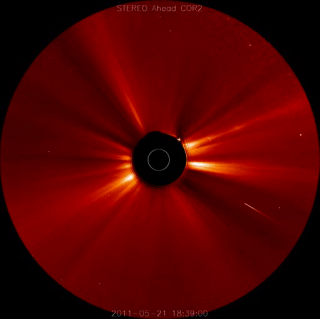 A sun-watching spacecraft has recorded views of an ill-fated comet plunging into the sun just after a huge solar eruption — the second time in 10 days that a comet dive-bombed Earth's star during a solar storm. Over May 20 and 21, the sun unleashed a big coronal mass ejection (CME), an immense burst of plasma that sent solar particles streaking into space at fantastic speeds. Shortly thereafter, a kamikaze comet barreled into the sun. And one of NASA's twin STEREO spacecraft caught it all on video, agency officials announced last week. This dramatic series of events followed closely on the heels of a similar spectacle less than two weeks earlier. Between May 10 and May 11, NASA's SOHO spacecraft spotted a different comet diving toward the sun, never to be seen again. A massive CME erupted at about the same time. Both of the recent kamikaze comets are thought to belong to the so-called Kreutz family of comets. Kreutz comets have orbits that approach within a few hundred thousand miles of the sun. All Kreutz comets are thought to be the remains of one giant comet that broke apart several centuries ago. They are named after 19th century astronomer Heinrich Kreutz, who first demonstrated that such comets were related. Coronal mass ejections shoot charged particles from the sun over several hours. Such solar eruptions can spew up to 10 billion tons of plasma and expand away from the sun at speeds topping 1 million mph, NASA officials have said. When these solar particles hit Earth's magnetic field, they can cause massive "geomagnetic storms," which have the potential to wreak long-lasting havoc on power and communications infrastructure around the globe. But the effects of CMEs are not all bad. The particles can also produce the spectacular light shows that we know as auroras (in the Northern Hemisphere, these displays are called the aurora borealis, or nothern lights). The sun is in the midst of an active phase of its 11-year solar weather cycle. The current cycle is known as Solar Cycle 24.